Pinterest has supplied me with a couple of cracking recipes. It’s like looking through an online magazine and I love to be able to see what something looks like before I cook it, it’s part of the inspiration process. This one was a doozy though, I couldn’t believe me eyes. 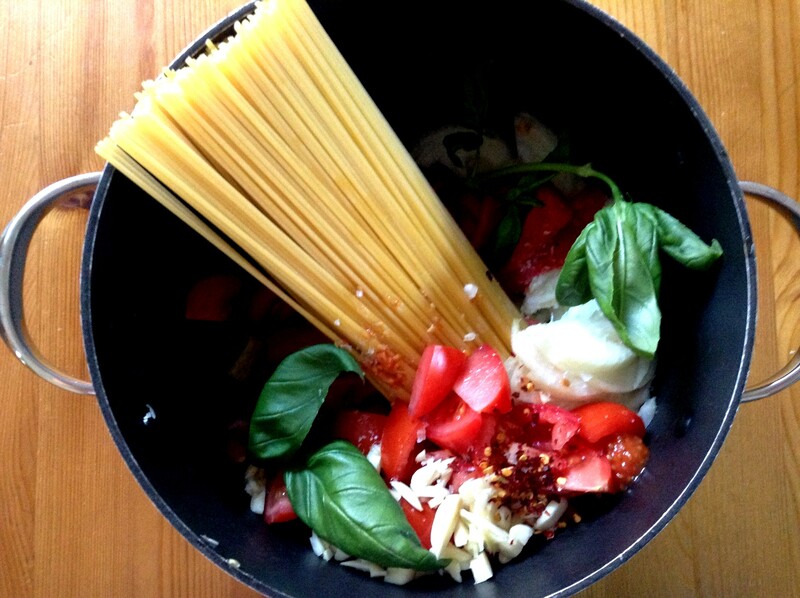 A one pot pasta dish? No separate sauce to make? Bring it to a boil and leave it? No way. But it works. By golly, does it work! I put all the ingredients in the pot, brought it to a boil, tossed it often and when the water was gone there was an oozy sauce, the tomatoes and onions had broken down and the pasta was perfectly cooked. Thank you, Martha, you are a culinary mastermind. 1. Place pasta, onions, garlic, tomatoes, roasted peppers, basil, red pepper flakes, tomato paste, 2 tsp salt and 1 tsp pepper in large pot. 2. Cover with stock or water and bring to a boil. 3. Toss often with tongs until liquid is nearly evaporated. 4. Serve with torn basil and a grating of parmesan or pecorino. I was definitely sceptical, but it works! I’ve done it twice now. This week I might try one with a pad thai sort of vibe, so stay tuned for that! I definitely will, that sounds so good! The pictures are getting better I think. Practice makes perfect! Love the image of the finished dish. Outstanding photography. On the roasted bell peppers,. were those from a jar? Yeah, I guess you could do them yourself if you’ve got that kind of time. Which I know you don’t! Tina, Tina! I just bought all the stuff! Also a bit of pancetta for extra flavor I will brown and grow on top at the end. You’re gonna grow pancetta?! =) I hope it’s tasty! Forgot to put that I added a tablespoon of tomato paste to richen it a bit! Great pictures Pami! What’s the total time from start to finish? About 15 minutes. It’s so fast. It’s really easy! I can’t believe I didn’t think it would work! Love the look of this, my type of food! 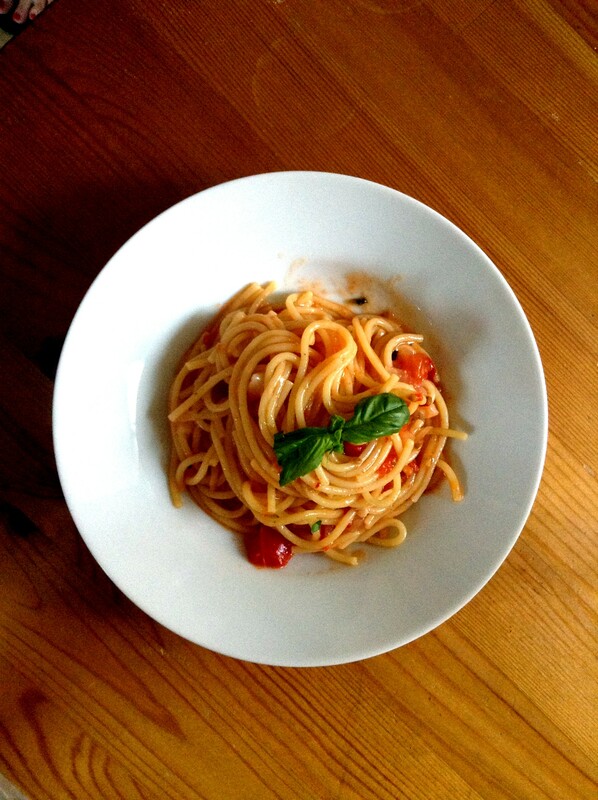 Nothing beats a lovely simple pasta dish. It was so quick and easy, and very delicious!